The Michigan Campaign Finance Network (MCFN) has been tracking the money flowing into Michigan politics for about two decades. Over that time, the numbers show the amount of money being spent to influence voters continues to trend upward. The numbers also show that dark money — money meant to sway voters that comes from unknown sources — is playing a larger role. The following graphics are meant to illustrate some of MCFN’s research. We encourage the public and media to share these graphics but we ask that you cite MCFN as your source. 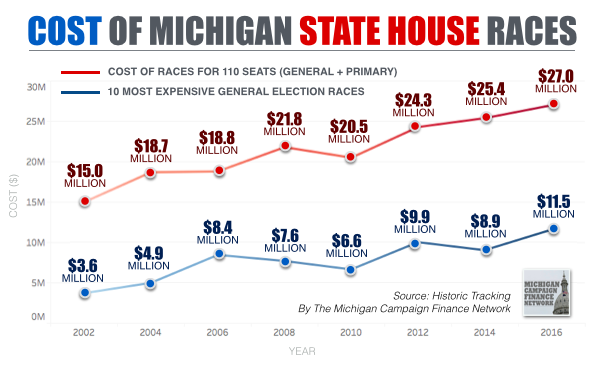 The cost of elections in Michigan and nationally is generally trending upward. One of the clearest demonstrations of this is MCFN's tracking of fundraising and spending in state House races. These races for the 110 seats in the Michigan House are held every two years. The total price tag of the primary and general elections for these races has been moving upward over the last two decades. 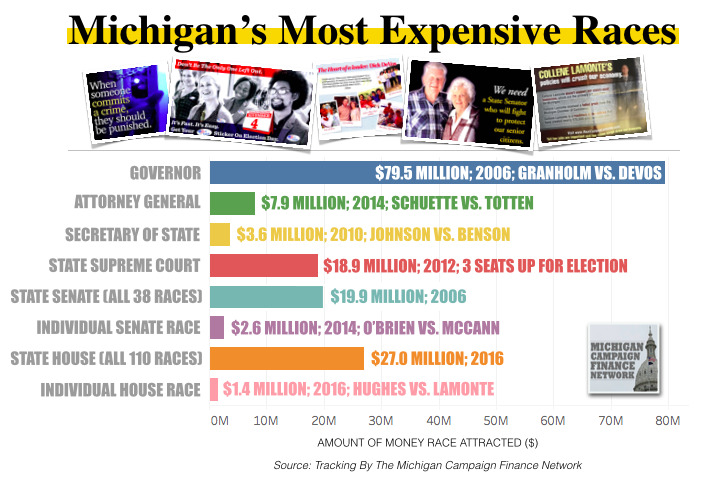 By the end of the 2010, Michigan had seen only five races for the state House that cost more than $1 million, according to MCFN's tracking of past elections. As the amount of money in Michigan politics grew, the next three election cycles — 2012, 2014 and 2016 — combined to bring 16 state House races that attracted more than $1 million. 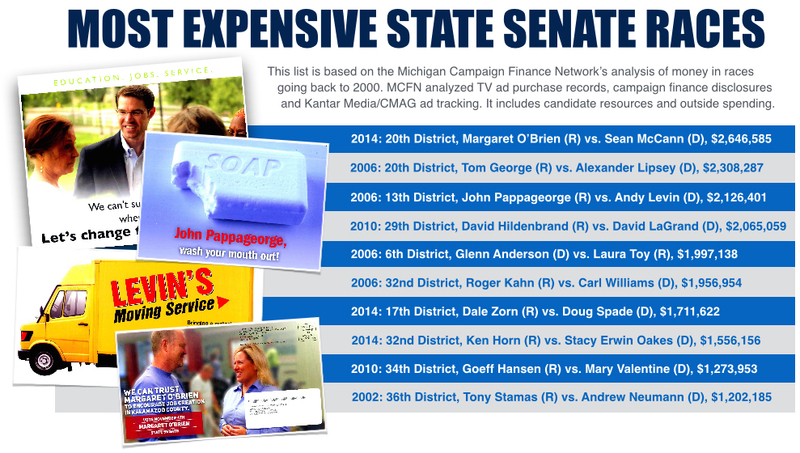 Scroll your mouse over the following graphic to explore Michigan's state House races that exceeded $1 million. The information is based on MCFN's tracking of TV ad reports and campaign finance disclosure in the races. As Michigan campaigns attract more and more dollars, the money is increasingly focused on the most competitive races. 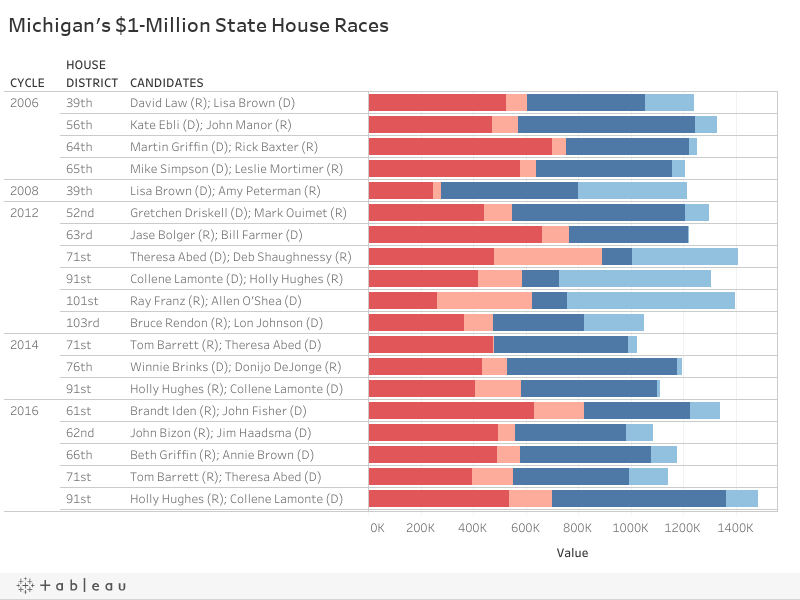 For instance, the 2016 election cycle — the last time state House races were on the ballot — saw the most expensive individual state House race at $1.4 million, according to MCFN's tracking. The last time state Senate races were on the ballot, 2014, the state saw the most expensive individual state Senate race at $2.6 million. 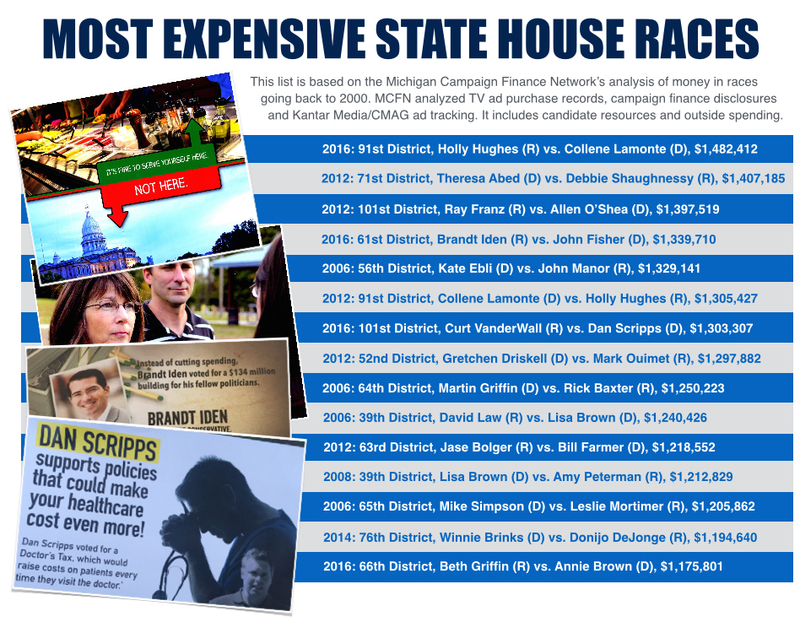 Of the eight most expensive state House races that MCFN has tracked, three occurred in the last election cycle, 2016. All eight of them have occured in the last three cycles. The most expensive individual state Senate race that MCFN has tracked happened in the 2014 election cycle. It was a race between two state representatives for an open seat in the state Senate. In MIchigan, campaign advertisements that don't expressly tell voters to support or oppose a specific candidate can avoid campaign finance reporting requirements. These types of communications can be in the form of TV advertisements, mailers or robocalls. By running these ads, which are supposed to focus on issue advocacy, groups can obscure or completely hide the names of donors who funded the ads. As a result, dark money has played a role in races at all levels of government in Michigan from precinct delegate to governor. 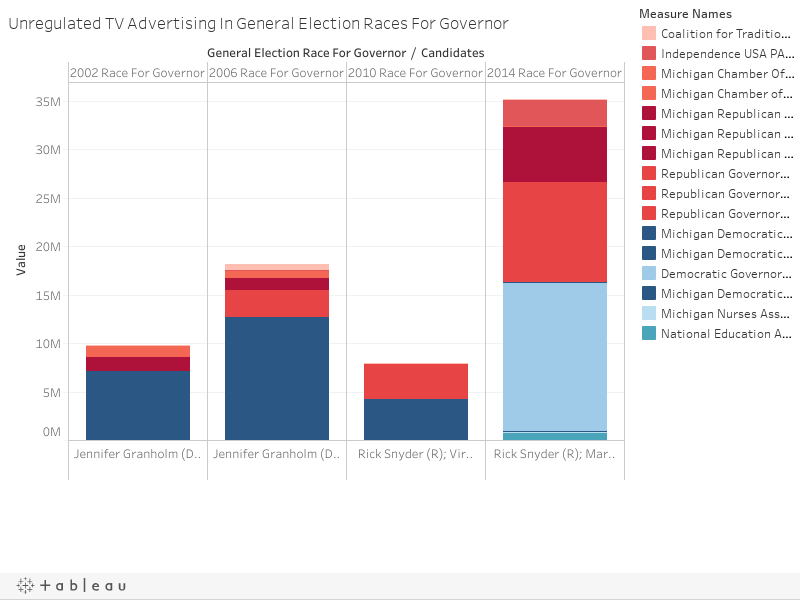 The following graphic shows the amount of spending on "issues ads" that fall outside Michigan disclosure requirements in races for governor. Races for seats on Michigan's Supreme Court have also seen an influx of money from anonymous sources. 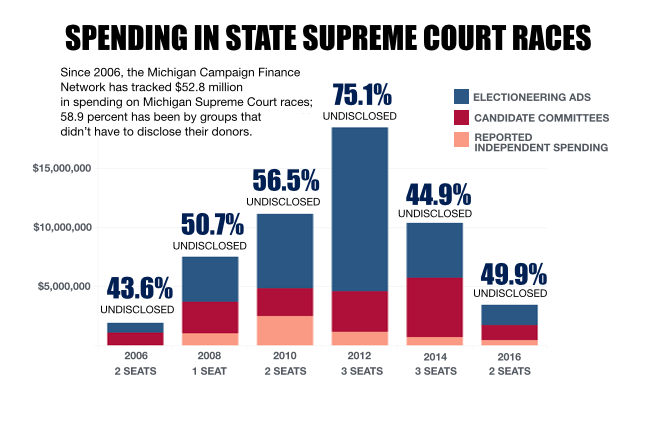 Since the 2006 election, more than half of the money in Michigan Supreme Court races has come from mystery donors. Registered lobbyists are indiviudals or entities who are either paying someone to try to influence policy by directly persuading officeholders or who are being paid to do that. Lobbyist spending in Michigan has been on the rise, according to public filings with the Michigan Secretary of State. 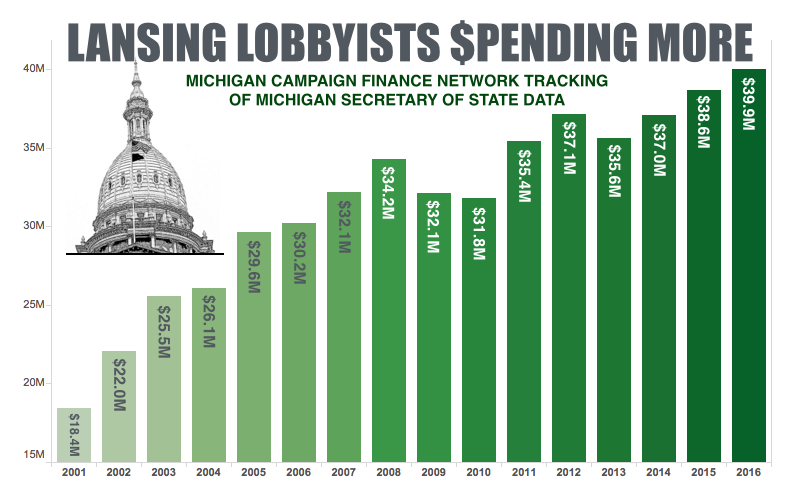 According to reports covering 2016, Michigan lobbyists reported spending nearly $40 million trying to influence policy in Lansing, the highest total for a year on record.